With all painting completed above and below the waterline, save for the boot stripe, our 1960 Cruisers Inc. Seafarer preservation project has her finish line in sight. Once we had stripped, sealed and installed the keel, we sanded her fair and sealed her with three coats of CPES. Three coats of Pettit Tie Coat Primer were applied, with hand sanding between coats – 100, 120 and 180 grit in succession, followed by a thorough cleaning with Pettit T120 solvent thinner. Three coats of Pettit Hard Racing Bronze Enamel were rolled and tipped, which left the surface smooth and glossy. Her strakes were sanded fair and sealed with three coats of CPES. Three coats of Interlux Pre-Kote Primer were applied, with hand sanding between coats – 120, 220 and 320 grit in succession, followed by a thorough cleaning with Interlux Special Liquid 333. 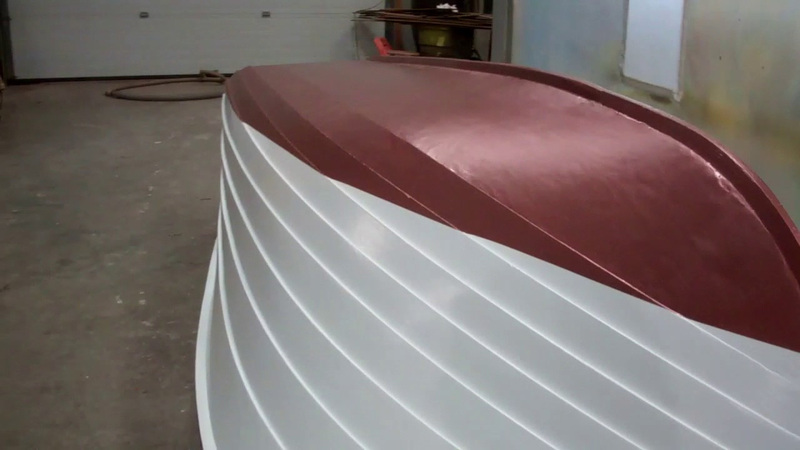 Three coats of semi-gloss white Interlux Premium Yacht Enamel were rolled and tipped. Hand sanding with 320 grit between coats assured us of a flat, slightly glossy surface. We will give the paint a few days to cure before masking off and applying her fire red Interlux Brightside boot stripe. With the stem and transom stripped, sanded fair, stained and sealed, we will shortly be applying the first of at least ten coats of Pettit Easypoxy Hi-Build Varnish, again hand sanding after coats 4 and 8, and possibly 10, before we apply the final coat. With her trailer having been converted from rollers to bunks, as is correct for wood hulls, fitting the trailer to her will conclude our work. Then she will return to Lake Placid, NY, where her eminently capable owners will enjoy completing a cosmetic freshening of the decks, gunwales and interior.